Elegance Protection & Practicality - ALL IN ONE! - iCASIT super slim snug fit case with Tempered Glass protects Apple Watch from bumps and scratches while enhancing your Apple Watch a single character that suits you. - iCASEIT offers premium quality Poly Carbonate super slim case and equally superb quality Tempered Glass. This unique and practical combination provides all round protection to your Apple Watch. - iCASEIT COMBi Apple Watch Case is only 0.5mm thick and combines with even thinner 0.33mm Tempered Glass screen protector. - High transparency and oleophobic anti-smudge coating maintain your Apple Watch's original high-definition viewing experience and high-sensitivity touch response. - Premium Tempered Glass effectively resist scratches thanks to its industry-high 9H hardness rating (harder than a knife). - iCASEIT COMBi Apple Watch Case is designed with an open base for convenient charging without the need of Case removal. - iCASEIT COMBi Apple Watch Case is simple to apply on and off wrist independent of removing the watch bands or need case removal for band removal. PREMIUM QUALITY - iCASEIT offers PREMIUM quality Polycarbonate SUPER SLIM case and equally SUPERB QUALITY Tempered Glass. This unique and practical combination provides all round protection to your Apple Watch. 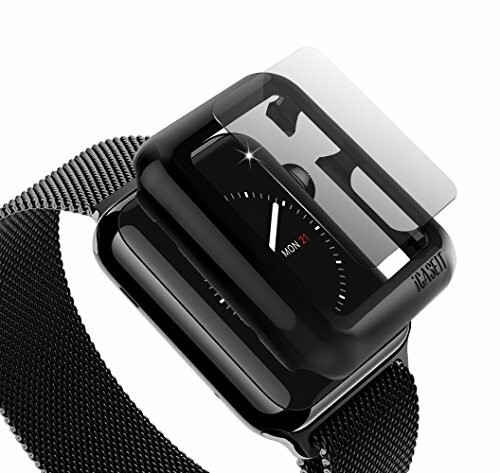 SUPER SLIM & FEATHER LIGHT - iCASEIT COMBi Apple Watch Case is only 0.5mm thick and combines with even thinner 0.33mm Tempered Glass Screen Protector. HD RETINA CLARITY - High transparency and oleophobic anti-smudge coating maintain your Apple Watch's original high-definition viewing experience and high-sensitivity touch response. ULTIMATE SCRATCH & BUMP PROTECTION - Premium Tempered Glass effectively PROTECT from Bumps & Scratches. Thanks to its industry-high 9H hardness rating (harder than a knife). CONVENIENT CHARGING - iCASEIT COMBi Case is designed with an open base for convenient charging without the need of Case removal. If you have any questions about this product by iCASEIT, contact us by completing and submitting the form below. If you are looking for a specif part number, please include it with your message.